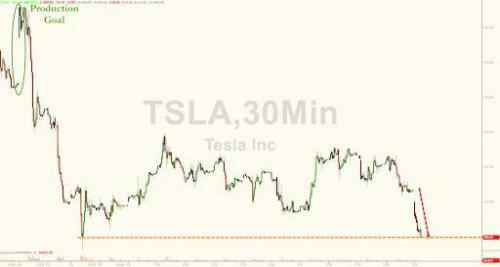 Tesla shares tumbled more than 4% in pre-market trading after a WSJ report that the electric car maker has turned to some suppliers for a refund of previously made payments in what the WSJ headlined as a bid "to turn a profit" but which reading through the article, said was a strategy "essential to Tesla’s continued operation", in other words if the cash demand fails, Tesla's future is in jeopardy. And, as we discussed, Tesla was not seeking to merely renegotiate contracts going forward, but in an unprecedented ask, the electric vehicle maker requested supplier return what it called a meaningful amount of money of its payments since 2016, effectively demanding that companies that had booked profits on sales to Tesla revise their books going back some two years ago. Quoted by Reuters, Morningstar analyst David Whiston said that “automakers often have brutal pricing demands on suppliers for future work, but retroactive rebates is not something we hear much about, and this is troubling for us to hear." "Only costs that actually apply to Q3 & beyond will be counted. It would not be correct to apply historical cost savings to current quarter." The latest demand merely adds to investors already substantial concerns about the company's liquidity. 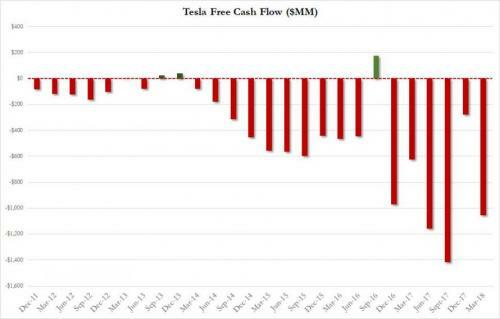 Tesla has been burning through cash as it ramps up production of its Model 3 sedan, with total cash burn in the first quarter hitting $12 million per day. While Musk has said the company does not need to raise cash this year, several analysts have predicted that the electric car maker would need to raise capital soon. Tesla has said the company will be profitable in the third and fourth quarters of the year, even though it has posted a loss of $709.6 million in its first quarter ended March 31. 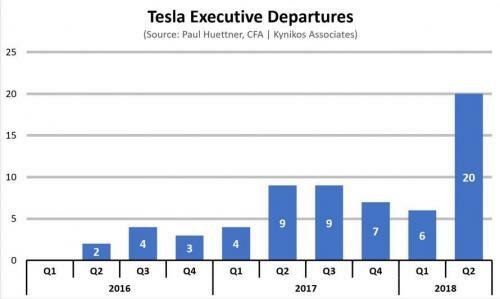 Last month, Tesla said it was cutting 9% of its workforce, amounting to several thousand jobs across the company in a bid to slash costs and become sustainably profitable without endangering the ramp up of Model 3 production. Meanwhile, there has been a sustained exodus of top level executive from the company, which accelerated in the current quarter. Tesla shares fell 4.3% to $300.27 in premarket trading on Monday, cutting the company's market cap by over $2 billion.